APPLY NOW FOR OUR 2019 EXPEDITION! It should be your dream. Two months of freedom before hitting the books again. But…something’s missing. You’ve enjoyed your camp experiences and family vacations in the past, but you’re ready for something different. You want adventure, learning, and an experience that you’ll never forget! Imagine if you could go on an 14-day expedition where you’ll ignite your passion for the environment, discover the power of photography and film-making and learn some incredible things about yourself. Picture a trip where you’ll learn about nature and the environment – but not in a boring way. More like, in an “Wow! That's SO cool!! !” kind of way. The summer you’ll never forget. Where you'll explore the outdoors, learn about nature conservation and environmental issues, and gently push yourself outside your comfort zone. Where you learn about yourself. Grow. And uncover the leadership skills and talents that have been brewing inside of you – but you never knew were there. Ready to get out of your comfort zone and have an incredible adventure? 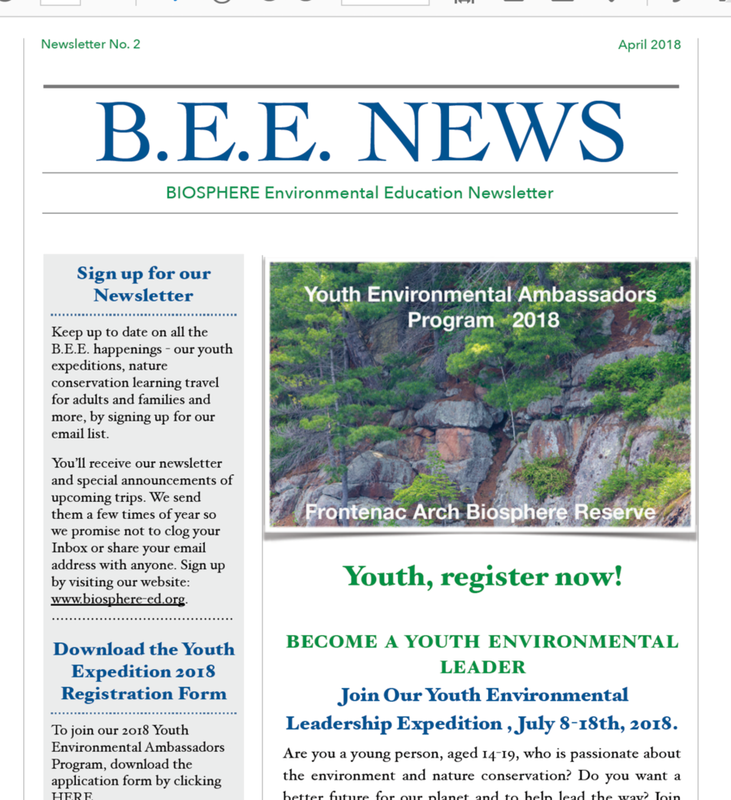 The Youth Environmental Leaders Expedition program is for youth who want to learn about environmental and conservation issues and who want to develop their leadership skills so they can help to create a sustainable future for our planet and people. We also teach you to become visual storytellers so that you can use photography and filmmaking to communicate about nature conservation and environmental issues and become changemakers. * Discover the power of visual storytelling by making a short documentary film, a photo gallery, etc. Want to see photos of our 2018 expedition? Click HERE to view them. ﻿Who is our youth expedition program for? We’re accepting registration for 14-19 year olds who want to live a life that’s different. One that has an impact. * Want to become a better leader with impact. Our adventure will take place on the Frontenac Arch in eastern Ontario, Canada. The Frontenac Arch is a special place - a UNESCO World Heritage Site. It’s an incredible place where the coming together of two distinct geological regions and five different forest types has created habitat for a diversity of species. It's one of Canada's 'biodiversity hotspots'. We’ll be staying at the Queen's University Biology Station (QUBS), near Kingston, Ontario, Canada. Located on Lake Opinicon, QUBS offers the full beauty and diversity of the region, surrounded by deciduous forest, rocky outcrops, and abundant wildlife. The field station has a number of cottages and cabins as accommodation, many hiking trails through forests and wetlands, and as a research station has research facilities, a library, and meeting rooms as well as their own herbarium. QUBS is an active research station and so research by graduate students and professors will be ongoing while we were staying there. QUBS has a large dining hall and provides 3 fabulous meals per day. We will explore the biodiversity of the region while learning about environmental and conservation issues and learning the tools of visual storytelling, all while having great outdoor adventures! While you’re exploring nature and discovering the expedition in its true form, you’ll be capturing it too. Over the course of the program, you’ll create your own nature conservation or environmental story using photography or film making. Story-building sessions focus on teaching participants how to use photography and film to communicate messages about nature conservation and environmental issues; they provide time for participants to work on their project by filming/photographing in the field, working on photo/film editing on the computer, story background research, brainstorming/storyboarding sessions, and story production. You'll learn all kinds of photography and filming techniques and tools. At the end of the expedition, participants will have produced a photography slideshow, mini-documentary film, photo-essay, or some other communication piece that we’ll share on the Biosphere YouTube Channel or website. * Capture, edit, and produce your photos or film to tell your story.... and then share it with the world! 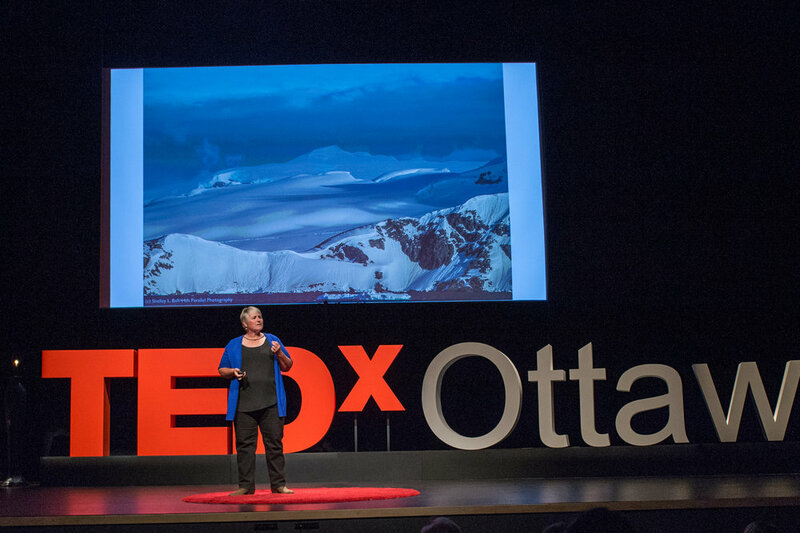 Dr. Shelley Ball will be your expedition leader and teacher for the 14-day expedition. She’ll guide you through your adventure, she’ll show you incredible things about nature and the environment, and teach you how to turn all of it into a powerful story using photography and film making. She’ll not just teach you about leadership, she’ll get you practicing leadership throughout our 14 day program. And she’ll encourage you to nudge yourself outside your comfort zone and grow as a person. Shelley is an easy-going yet passionate leader who loves nature, protecting the environment, adventure, and telling a good story with photos and film making. Her mission in life is to connect people to nature and to inspire them to care about it and protect it. She is a Fellow of the Royal Canadian Geographical Society and a mentor with the Canadian Federation of University Women ( CFUW) National Mentoring Program and the winner of the 2018 CFUW National Mentoring Award. She is also currently Chair of the Environment Committee for the CFUW - Perth & District and in March 2018 represented CFUW at the United Nations 62nd Commission on the Status of Women. Shelley was also a member of the inaugural Homeward Bound Women In Science Leadership Expedition to Antarctica in December 2016. She is also a professional public speaker and author. * She’s also a career mentor and life coach. Shelley loves to help people discover their true passion in life. Shelley launched Biosphere Environmental Education in order to give people the opportunity to get close to nature and learn about the environment through adventure! While she may be called a doctor, she’s a teacher at heart. She’ll lead you through the expedition and share her expertise and knowledge in a fun setting that’ll change your life. Our adventure this year will take place on the Frontenac Arch, a very special place here in eastern Ontario (Canada), which is a UNESCO World Heritage Site. It is a 'biodiversity hotspot' in Canada and is known for its rocky outcrops, beautiful forests, and thousands of lakes and wetlands. Day 11- Exploring Dunder Rock and Story-building Session 6 to finish the group video project. Evening Circle Discussions - these include learning and discussion about conservation and environmental issues and leadership development discussions and activities. Recreation time - this includes sports activities such as volleyball, soccer, self-directed activities, or time to just to rest and relax. Our incredible Education Program, including instructional workshops in photography, videography, communication and leadership as well as lectures, discussions, team building exercises and more! Maximum 8 participants. We keep our group sizes small because we want to ensure each participant gets the individual attention they need to support their learning and an outstanding experience. Ready to join our expedition? we are Now Accepting applications. ENROLMENT is limited!